British Cabinet minister's plans for the next stage of Brexit appear to be based on "pure illusion", Donald Tusk has said. 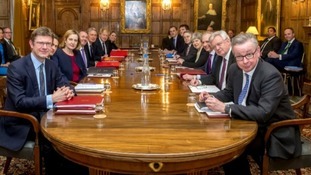 The European Council president's comments follow the much touted "war Cabinet" meeting of ministers at Chequers, the PM's official country residence, where Theresa May's inner circle gathered to agree the UK's Brexit agenda. The prime minister's official spokesman characterised the supposedly historic eight-hour meeting as "very positive ... and a step forward". A key outcome of the meeting was the decision to pursue a policy putting Britain outside a customs union with the EU, but matching Brussels rules in certain sectors in an attempt to achieve "frictionless" trade. Will the EU countenance May’s trade plan? But Mr Tusk, who was speaking at a press conference in Brussels, said the move still sounded like the UK was trying to have its cake and eat it. "I am glad that the UK government seems to be moving towards a more detailed position," Mr Tusk said. "However, if the media reports are correct I am afraid that the UK position today is based on pure illusion. "It looks like the cake philosophy is still alive. From the very start it has been a key principle of the EU 27 that there can be no cherry-picking and no single market a la carte. "This is, and will continue to be, a key principle, I have no doubt." Off the back of the Chequers meeting, Mrs May is to deliver a long-awaited speech setting out her vision for Britain's future relationship with the EU on Friday March 2.